• Design Odeh Engineers, Inc. 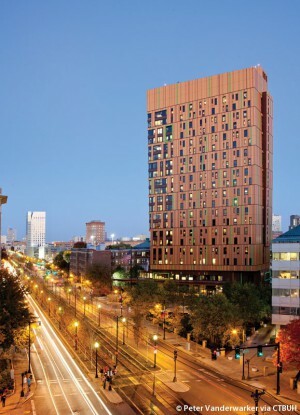 This new residence tower results from a highly unusual collaborative process and responds to the unique living/learning requirements of art school students. Inspired by Gustav Klimt’s painting Tree of Life, this innovative high-rise includes 493 beds for freshmen and sophomores in 136 suites configured in one, two, or three-bedroom layouts. The project features a ground floor café and living room, a second-floor health center; and a “Pajama Floor” at the third level with communal kitchen, game room, laundry facilities, and fitness center. Studio spaces alternate with lounges on the 17 upper floors. The new tower is located along Boston’s Huntington Avenue, in a heterogeneous neighborhood of warm-toned, brick buildings, residence halls, and academic facilities. The MBTA’s Green Line passes directly in front of the site and the Colleges of the Fenway path bounds the southern edge. The project’s curved stone base accommodates an underground tunnel that swerves through the site and required architects to cantilever the rectangular building above. During the design process, the team worked to harmonize the goals and aspirations of professors, administrators, students, trustees, alumni, city and state agencies, neighbors, and the building’s owner. The architect conducted in-depth benchmarking, hosted focus groups and an 85-person design charrette, and developed full-scale mock-up units for students to experience and critique. Students in the college’s architecture and interior design programs helped shape some of the project’s common areas, including the ground floor café. Lean construction methods were used to fast-track building trades and bring the project to completion three months before the fall opening. The exterior is an organic mosaic of over 5,000 composite aluminum panels of varying depths and hues. Dark browns at the base mirror tree bark before growing progressively lighter to make the building appear taller and lighter in the skyline. Green window panels punctuate the façade like the leaves of a tree. The project’s interior spaces are infused with art ranging from commissioned alumni pieces in the lobby to a rotating gallery on the third floor. While the budget did not allow for expensive finishes, designers drew on the possibilities of modest materials such as carpet and paint to develop a bold visual statement that activates the space through color. The residence hall’s design and engineering decisions were made with solar orientation in mind. Windows on the tower’s north side provide light favorable to the work of resident art students, while the smaller number of windows on the south side help reduce heat. The windows are operable and the school employs an electronic system that informs students of advisable times to open or close them. The building received a Silver LEED certification from the U.S. Green Building Council and its energy usage is 22 percent more efficient than code mandates. Other green features include double insulated metal panels, and low- flow plumbing fixtures that reduce the amount of potable water usage by 33 percent. More than 50 percent of the material used in the residential hall has recycled content, 20 percent from local sources, and 70 percent of the wood is certified by the Forest Stewardship Council.